A prolonged instrumental introduction built up both the tension and also the electric atmosphere in the venue before the curtain dropped, signaling that it’s show time! Opening up with the title track from Crooked Teeth which, as a new song, was immediately warmly received by the hungry fans. This was quickly followed by two back catalogue classics in “Getting Away with Murder” and “Between Angels and Insects”. It was not all just about the old songs however, as the band played a setlist which was well-balanced between newer tracks and the older anthems, blasting out classics in the mix with the new tracks. Jacoby requested a pit for the second of those older tunes, and the passionate fans tonight in Manchester were more than happy to oblige. “F.E.A.R.” heralded a newer element to the classic Papa Roach sound, as the title track of the band’s previous album incorporated some commercial and dance influences into their sound mix. Following “Geronimo” in the set is “Born to Greatness”, another new track, and once again fans responding as passionately as it was a much-lauded anthem. Speaking of those, “She Loves Me Not” follows up next. The track and positioning of new and old could have fallen flat on its face, but instead it’s a seamless transition between both as fans show no letup in their energy levels in a boiling heat fit to burst the Manchester venue. The customary band introductions are up next, before an emotive and melodic version of “Scars”, the autobiographical song that invokes many personal connections judging from the fans faces all around me tonight. The song builds to an all-inclusive chorus and it is clear from reading his facial expression that singer Jacoby is very moved by the warming response that the track has generated. The mellow element is continued by the track “Periscope”, which nearly invokes a dance/trance beat. Sadly, tonight Skylar Grey who contributes to the song/video is not present tonight on the Manchester stage. However, the fans contribute to the backing chorus and help to guide the band through the performance. “Gravity”, featuring a more rap-style vocal helps to restore the energy levels, by raising the sonics slightly louder but still not at the high-octane levels of earlier in the set. For many bands, having a slow-interlude would detract from the setlists flow. Not the case as fans seemed to appreciate the taking down of the aggression, allowing them to recharge their energy for the second part of the band’s set. They would definitely need it. The evolution of the band could clearly be illustrated by the quieter part of the set. I doubt that many fans would have appreciated a slower midway section when they were touring their first two albums of angst and aggression. The cover version of Blur’s “Song #2” was not that much of a surprise to me personally, as it had always been a particularly heavy and anthemic track even for Blur themselves. This tune was also reciprocated by an outbreak of hysteria as the adoring rock fans embraced it to their hearts and respond appropriately. “Traumatic” from the latest album is delivered next and belying its title, it is a melodic mid-paced tune and slower in musical direction. This temporarily gives the fans and the band another chance to settle and temporarily rest their energies. 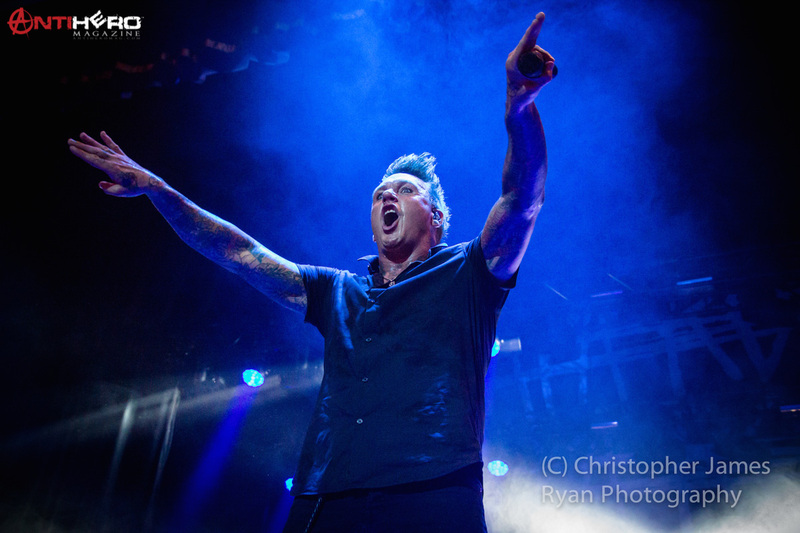 Then the breakdown causes Jacoby to create a demand for a circle pit before the brutality of the song’s second half ignites an explosion of energy throughout the audience. Inserting a little bit of Linkin Park’s “In the End” into “Forever” allows the singer to again establish a deep fan connection, paying homage also to that band’s recently departed singer. Opening a little personally with some insight into his own mental health issues again allows him to relate directly to many people in the venue around me. Highlighting his own experience also allows people in the spotlight to help and assist others less fortunate and less famous but who are experiencing similar issues. Latest single “American Dream” is quickly followed by an emotive version of “Lifelines” stripped back and played acoustically. This allows a different interpretation of the song which highlights some of its lyrical content in a bare format. Powerful new track “Help” restores the tempo again and allows the fans to regain their singing voices and their passionate response. Encore time delivers much more as “Blood Brothers”, “Dead Cell”, and “Last Resort” all from the band’s debut restore the insanity all around, with circle pits going off in all directions and an ever-increasing wave of stage divers heading in the direction of the stage. An emotive mid-paced “To Be Loved” brings the show’s proceedings to a conclusion. For people that dismiss the band and try to box them into a single defined category (you know what I mean), they have clearly not familiarized themselves with the band’s ever-evolving sound and development. Papa Roach are still delivering, still entertaining, and while not quite “Getting Away with Murder”, they certainly appear to be “Born For Greatness”.